If Olivia Voldaren controls an animated Haunted Plate Mail, if Haunted Plate Mail stops being a creature, does it go back to its owner? So let’s see what happens here. First, let’s assume that the Haunted Plate Mail got hit by Olivia Voldaren’s first ability for it to become a Vampire. 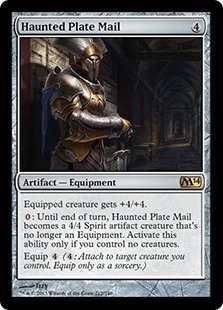 Haunted Plate Mail is now a 4/4 Vampire Spirit artifact creature in this case. Then Olivia’s controller took control of the Plate Mail. Second, we’ll see what happens when the turn ends, as Haunted Plate Mail’s duration lasts only for a turn. 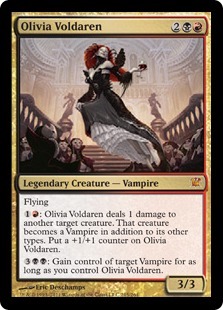 Olivia’s second ability states that you gain control of target Vampire for as long as you control Olivia Voldaren. Haunted Plate Mail stops being a creature, so it’s no longer a Vampire. But does this remove the Plate Mail from being controlled? While Haunted Plate Mail isn’t a Vampire anymore (because creature types can’t be applied to non-creature permanents), Olivia’s control ability still applies for that permanent. Olivia’s second ability doesn’t care if that permanent is no longer a Vampire (or in this case, no longer a creature). For as long as you control Olivia, you still have control of that permanent. For sure, Olivia’s second ability is an indefinite duration. Sadly, the only thing that you can do with the heavy armor is to put it onto Olivia Voldaren’s already huge build.